WHAT IS THE EASIEST WAY TO STRETCH A CANVAS? This content was written by Brian Abrahamson, ChromaZone Ink, Melbourne FL. Don’t You Think Canvas Stretching Should Be Easier? We’ve perfected the easiest way to stretch canvas! For hundreds of years, canvas and fabrics have been mounted on wood frames for displaying art. For decades the only approach was to use pliers and flat head nails or staples to attach the canvas to the frame. Mass produced digitally reproduced art has taken the world by storm. I think you would agree that there is a huge need for an affordable tool to assist the moderate to high volume digital lab for stretching canvas prints. 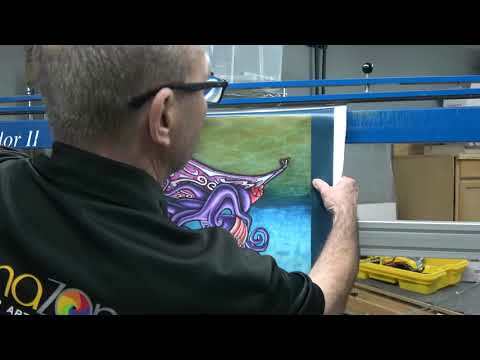 At ChromaZone Ink Canvas Prints Orlando | Melbourne, we have tested many machines used for stretching giclée prints on canvas, and we’re happy to share our experiences if you want to call 321-312-4800 | 800-501-2901. At ChromaZone Ink Canvas Prints we have been using the Tensador II Canvas stretcher for our giclée canvas printing for over 15 years now. This industry proven workhorse has demonstrated itself time and time again to be the tool of choice for many of the biggest names in the giclée canvas printing business. The versatility, low maintenance and small footprint make it an ideal choice for labs big and small. Once you’ve mastered the process, you can easily stretch and finish canvas prints up to 40 x 60 inches on a variety of different size stretcher bar profiles. In this post I’m going to tell you exactly how we have mastered the use of the Tensador II over the years. The first thing I must stress is that the Tensador II is really a TOOL, not a machine. Because it is labeled a “Canvas Stretching Machine” or “Canvas Stretcher”, it tends to direct the novice user or potential buyer into the wrong mind set as to its function. The “Machine” nomenclature leads you to believe it automatically gets the job done by the push of a button. Not so with the Tensador. The lack of expensive electronics which are often subject to electrical fluctuations are actually one of its key benefits. Think of the Tensadore as a giant set of stretching pliers. Like most tools, the Tensador II is only as good as the operator using it. You have to understand the capabilities and the function before you can put it to good use. ChromaZone Ink has worked closely with the manufacturer of the Tensador II over the past 15 years testing and modifying both models. If you think of it as just a big heavy vertical pair of pliers you are on the right track. Without the interface and knowledge of a good and experienced operator it may not seem easy from the start. It uses clamping power and leverage applied by the operator to achieve the desired result. But don’t be discouraged yet. Like anything worth it, it just takes practice! One of the biggest mistakes a new owner or operator will make is beginning with a large canvas print to learn with. They go stampeding to the biggest giclée on canvas in the shop to impress themselves or the boss only to fail miserably in the end. Start small and gradually increase to larger pieces as you learn the process. Every canvas is different. At ChromaZone Ink Canvas Prints Orlando, nearly 80% of what we print and stretch are images with mirrored or image wrapped sides. These are among the easiest for beginners to start with. There are no hard edges on the image you have to align perfectly with the edge of the stretcher frame. You always have a little “Wiggle Room” with these setups. Among the hardest canvas prints to stretch and align properly are the solid-colored side gallery wraps where the image and it’s associated colored border have to align perfectly with the edge of the stretcher frame. These should be incorporated into your training and work flow only after the previous image wraps have been mastered. While this tip is not necessarily about the easiest way to stretch a canvas, it has very important information about the type of canvas you choose. Every canvas is different. The density, weave, coating and weight make up a myriad of variables you have to consider to successfully get consistent results. Most canvases are somewhat elastic with the exception of the cheaper 100% polyester products most commonly used in the big box stores and overseas offerings. This amount of stretching can cause havoc in any production house where precision stretching and finishing is key. Image size modifications prior to printing sometimes play an important role in the accuracy of the final finished canvas. Larger canvases will stretch further than the smaller sizes. You may have to reduce the size of a large canvas ever so slightly to compensate for the amount it lengthens during the stretching process. You may have to increase the size of the image in smaller canvases in order to compensate for the additional length needed to go over the radius of the molding profile. You also may need to change the image size in only one direction depending on the size. An example would be a 10x30 panorama where the 30-inch length needs to be reduced by 1/8” and the 10-inch direction remains the same. Among the hardest canvases to stretch are the heavy duty gloss and satin products that approach or exceed 20ml thicknesses. By the time they are printed and coated with your favorite UV coating they resemble a rigid piece of plastic making the stretching process nearly impossible. The amount of tension needed to wrap and get the canvas to flatten on the edge of the stretcher bar is not easy. If the sides of your stretched canvases have any amount of space between the canvas and the stretcher bar you can guarantee that canvas will loosen in time. At ChromaZone Ink Canvas and Metal Printing Orlando we have tested and used most every canvas on the market today and have settled on about 5 as our go-to canvases of choice. Our advice is to find a reliable, sustainable source and stick with the choices you make. The minimal footprint of the Tensador II makes it an ideal choice for the growing print or high production studio with limited space. With the vertical design, you can introduce more units into your workflow as your business grows without relocating to a larger facility. It is not uncommon to see more than a dozen of these canvas stretchers in some of the largest facilities in the US and Europe. Once you’ve got the hang of it, it truly is the easiest way to stretch a canvas! Now that you understand these crucial basic concepts, it is also important to know that Brian, our founder at ChromaZone Ink has trained and consulted for some of the biggest names in the business over the years. In fact, in keeping with our “full transparency” mindset, Brian created this training video for the Tensador product line for our employees, and he is happy to share it with the world. Check it out! For more information on the care and use of a Tensador II stretching machine call us at 312-321-4800 | 800-501-2901. ChromaZone Ink Canvas Prints Orlando would love to be your giclée printing company.